A policeman along with 11 others were caught attempting to illegally flee the country, off the coast of Matara on Thursday (7) night.�A police constable from Kokkadicholai in the Batticaloa district, along with three of his children, were part of a group of 12 suspected asylum seekers caught by the Matara Police in the Dikwella area. The group comprised eight Tamils and four Sinhala nationals, of whom four were females and eight males. According to Police spokesman G.M.H.B. Siriwardhane, they were suspected of fleeing to Australia. He also added that they were being held by the Matara police for questioning. 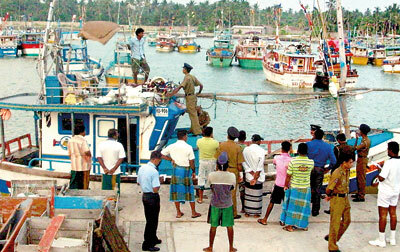 �Earlier that day (7), a much larger band of 54 asylum seekers were caught off the coast of Weligama, by the Navy. �The group consisted of three Sinhalese and 51 Tamils, of whom 36 were males, 7 females and 11 children. According to Navy spokesman Kosala Warnakulasuriya, they were handed over to the Criminal Investigations Department (CID) at the Galle harbour, around 6.00 pm that evening.�These incidents have surfaced after nearly a month’s lull in asylum seeking by boat.